Dense vias, heat and strong! Increase in the input and output terminals respectively X7R high-Q high frequency bypass capacitor, electromagnetic compatibility super! Output Voltage Range: 1.25V to 35V DC voltage is continuously adjustable, high efficiency (maximum 92%) of the maximum output current of 3A. Output 2A or less long period of time without additional heat sink output current is greater than 2.5A (or output power greater than 10W) to work long hours please add heat sink. Output: 1.25V to 35V DC voltage is continuously adjustable, high efficiency and maximum output current of 3A. 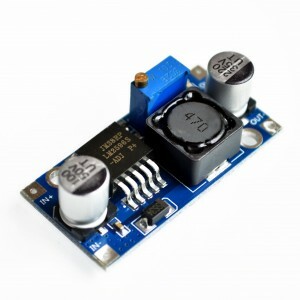 Access to power (3-35V), adjust the blue potentiometer knob (clockwise rotation generally boost, buck counterclockwise rotation) and with a multimeter to monitor the output voltage reaches the required voltage. 2. solder pins, or pins can be inserted through the lead insertion use in tunnel plate; soldered directly to the PCB after another or add pins. 1. The vehicle power supply, only need to enter this module termination point the car cigarette power supply, you can adjust the potentiometer, the output voltage can be adjusted in 1.25-30V, for your phone, MP3, MP4, PSP charging many devices powered, very simple and convenient. 2. The power to the electronic device when the device needs 3-30V power supply voltage corresponding to the hand while using this module you can easily put the voltage to the desired voltage and solve problems. 3. The system voltage test can be used to make this project a variety of debugging module voltage test system operating voltage range, very easy and convenient.